The first theme for this year was Pirate Thief, so let's jump straight into it. 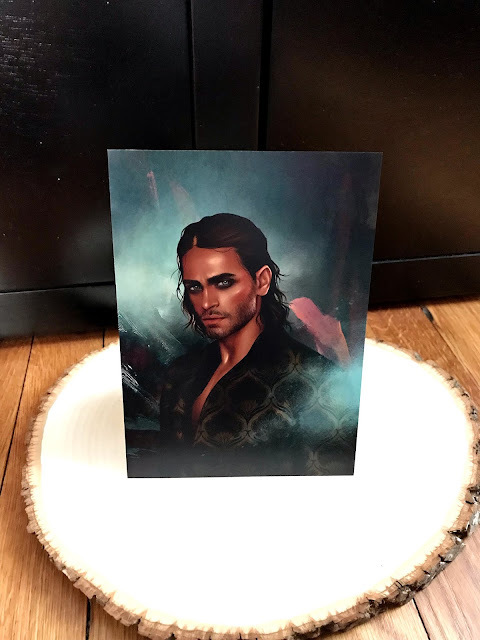 First up was this print of Captain Rolfe from the Throne of Glass series designed by Salome Tortladze. This is the first time I've ever received something by her in a subscription box before, but I dig her style. It's exactly how I pictured Rolfe while reading the series. Can you have a pirate theme without something drinking related? 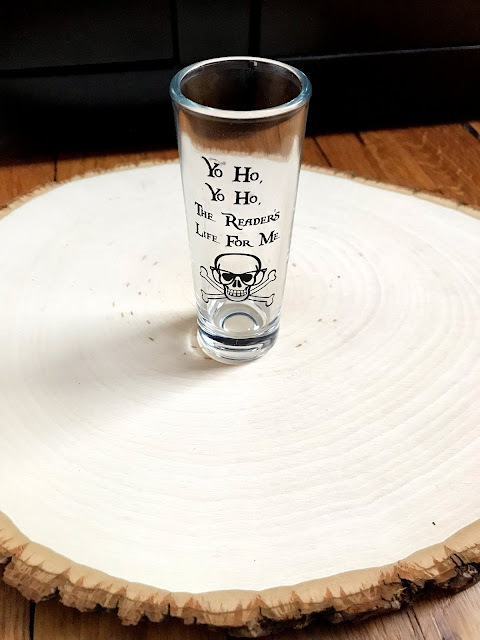 This little shot glass was a LitJoy exclusive, and it's a cute little addition for your bookshelf. Next up was another exclusive item, a Pirates of the Caribbean inspired charm bracelet. 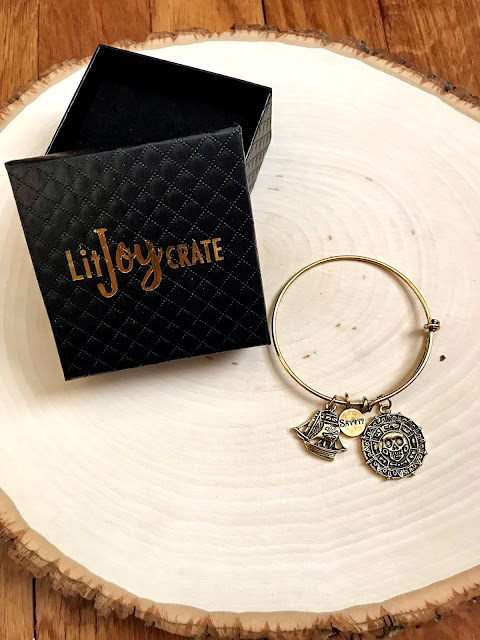 I'm not a huge fan of the PotC movies, I think I only saw the first two and only liked the first, but I do like these types of bracelets. 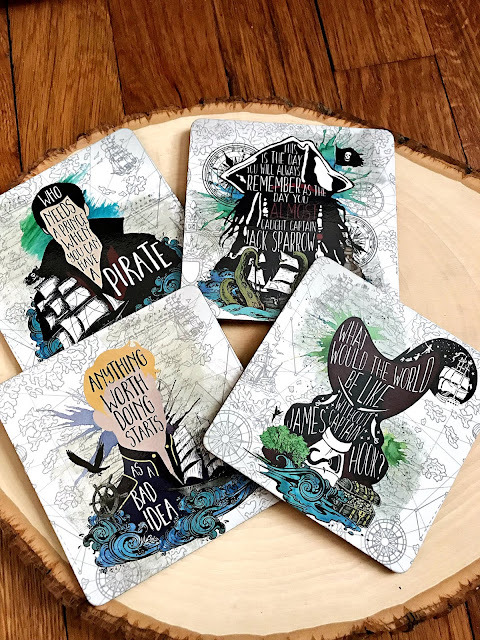 These coasters featuring four famous pirates were designed by EvieBookish. They're really nice quality and I'm always a fan of her designs. What goes hand in hand with pirates? A sea monster, of course! This kraken banner is really fun on its own or can be used as a pin banner. Mine did come untied, but that's no big deal. Then we had two more of the LitJoy Collectors Trading Cards of Manon and Lysandra from the Throne of Glass series. Both of these are some of my favorite characters in that series, especially Manon, so I'm super excited about these. This month LitJoy included two books. The first was Brightly Burning by Alexa Donne. This follows the story of Stella, who is living on a spaceship which has been orbiting around an ice-encased Earth for two hundred years. With no prospects, Stella will do anything to leave, and jumps at the chance to be a governess on the private ship, the Rochester. The captain, Hugo Fairfax, is notoriously moody and a bit of a drunk, but he's kind to Stella. 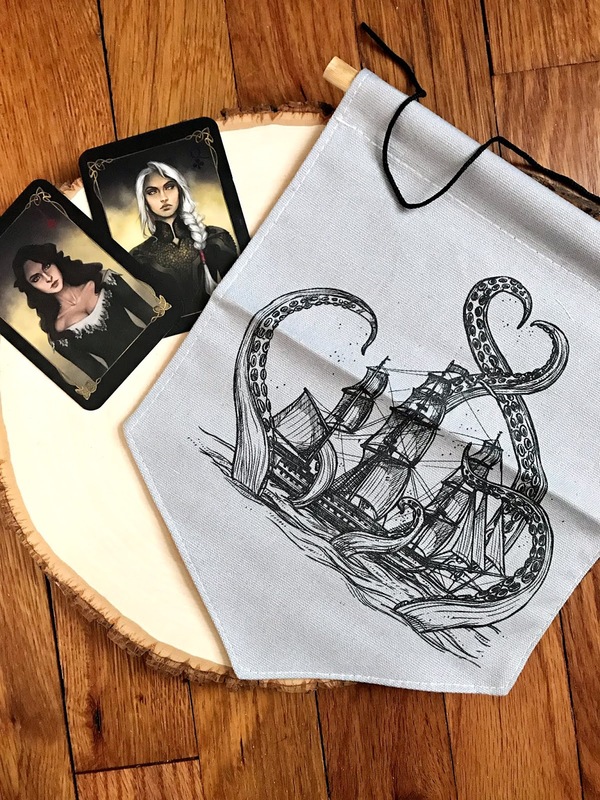 While on the ship, Stella discovers that someone is trying to kill Hugo, and the more she digs the more she uncovers a conspiracy aboard the Rochester. This is supposed to be a Jane Eyre retelling in space, so I'm interested to see how it plays out. 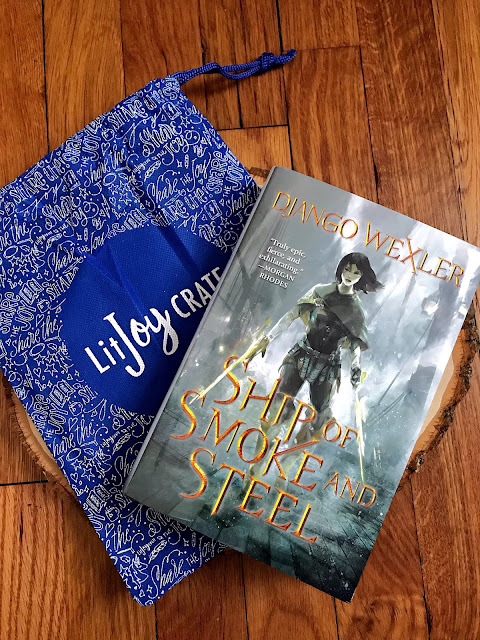 The main book of the month was Ship of Smoke and Steel by Django Wexler. In the lower wards of Kahnzoka, the great port city of the Blessed Empire, 18 year old Isoka is a ward boss who enforces the will of her criminal masters by way of the power of Melos, the Well of Combat. 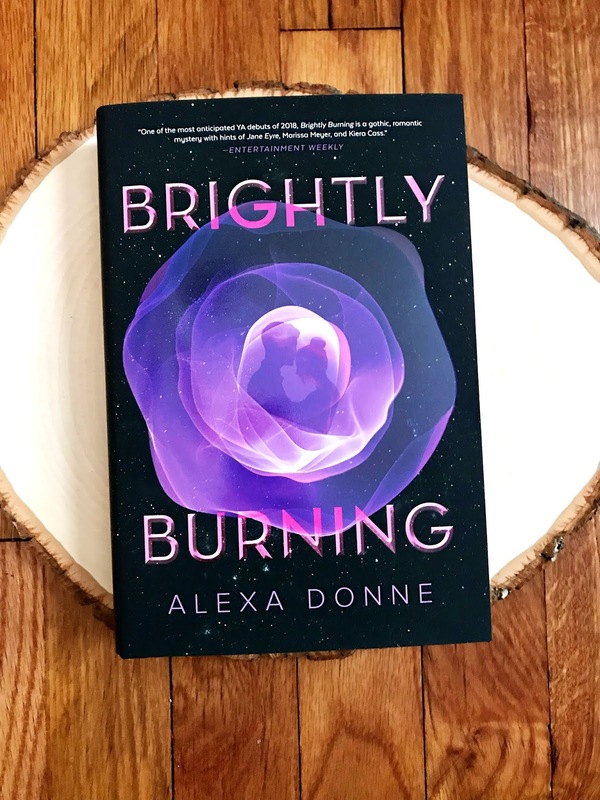 When her unique ability is discovered by the government, she's arrested and taken before the Empire and assigned a difficult mission: steal Soliton, a legendary ghost ship that no one has ever returned from, and if she fails, her sister's life is forfeit. Isoka must become part of Solition's brutal crew and confront an even darker magic than what she possesses. This month they put the book in its own little cloth bag, which I thought was a nice touch. To be honest, although I did like some of the stuff they sent, this box sorta left me a little underwhelmed. Hopefully next month will be a bit more exciting!